"The shoes anciently wore, were a piece of the hide of a deer, cow, or horse, with the hair on, being tied behind and before with a point (lace) of leather. The generality now wear shoes, having one thin sole only, aand shaped after the right and left foot; so that what is for one foot will not serve the other"-Martin Martin's "Western Isles," 1703. Shoes are often one of the more difficult items of apparel for the re-enactor to obtain. Handmade footwear in a period style is expensive. Even simple shoes can cost over $100, and the price often goes up from there. As a result, a common problem among re-enactors is an otherwise good portrait of a historical character, marred by modern-styled moccasins, or shoes. Fortunately, there are a number of less expensive options available, especially for persons portraying Scottish, or Irish characters. The simplest are "ghillies," rivlins, cuarans, or pampooties. These moccasin-like shoes are all based on a simple patterns which are gathered around the foot with a drawstring lace -a "point", made of leather, or rawhide. 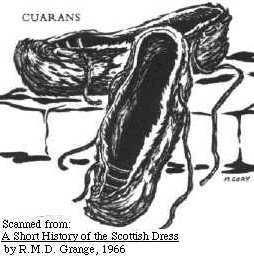 These are the ancestors of the scalloped-upper "dance ghillies" worn by modern Highland, or Irish dancers. Cuarans, or rivelins are based on the same rough shape as the ghillie, but often without the slits in the leather around the toes. The disadvantage with this is that it requires thinner leather for it to gather together around the toes comfortably, and it offers a less coverage to the top of the foot. Pampooties were an Irish name for a shoe based on the same draw-string idea. All of these examples were usually made of rawhide, often with the fur, or hair still on the skin. Rawhide is not recommended since it usually needs to be kept wet, or moist to be wearable. They can be made with tanned hide for modern practicality. Rawhide will also tend to get slimy if too wet, and more slippery under foot and probably will eventually begin to rot and smell. Historically, ghillies had a single-layer sole, but they can be made to last longer by gluing on an additional outer sole of heavy leather, (or the extra thickness of leather can be hidden and simply glued in as an inner sole). Most shoe repair shops are willing to sew the result together for around $10.00. People who are accustomed to the support of modern shoes occasionally find ghillies difficult to wear for extended periods. Dr. Scholes' Back Savers are a recommended help. These not only provide some arch support, but also have additional padding for the heel of the foot, and also supply an extra layer of protection when walking over rocks or stones. It has been brought to our attention that the ghillie-brogue pattern we had acquired free through the historical re-enactment community, and was formerly posted here, may have been copied from a copyrighted design owned, and sold by http://www.Medieval.Moccasins.com. In order to honor their 1985 copyright we have removed the pattern from this site.